The scientific study of speech process and analysis of sound. The unit of sound, like; /g/, /k/, /t/ etc. Practical use of phonetics and study of sound system. The word of which you see the meanings in dictionary. Consonants, as explained in previous chapter, are those sounds which are pronounced / uttered by the touch of two organs. More explanation you will see below under origins of sounds. 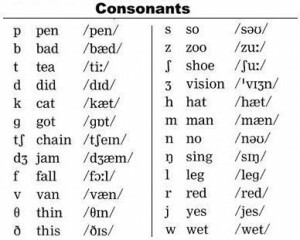 Below is the chart of all the consonants. Whenever you open a dictionary one thing which is right at the start and unfortunately mostly neglected is the pronunciation guide, quite like as the chart below. We are usually more concerned about the meanings than anything else. First column: Contains phonemes, a unit of sound. Second column: Contains words that use the phoneme of the first column. Third column: Contains transcription. Transcription is phonological presentation of the sound of any word. Alveolar ridge or teeth ridge: A ridge behind teeth and before hard palate. Hard palate: Mouth’s roof above tongue. Soft palate: behind hard palate there is soft palate. It is called soft because it is not backed by bone like hard palate. Glottis: The vocal cords that are part of larynx. Sound is explained with respect to its origin and since consonants are pronounced by the touch of two organs in vocal tract so the origin means those two organs. See the explanation below. Bilabial sounds are those which are uttered by the touch of two lips, like; /b/ and /p/. Those sounds which are uttered by the touch of lower lip with upper teeth, like; /f/. The sounds pronounced by the touch of tongue with soft palate, like; /k/ and /g/. The symbol of glottal /h/ is used when any voiceless consonant is aspirated. Aspiration is audible and forceful release of breath, like; ph, Kh. Plosives are those consonant sound which are pronounced by sudden release of air, like; /p/, /b/, /k/, /g/, /th- sound/and /th- sound2/. Such consonant sounds that give hissing effect, like; /f/ and /z/. Sounds pronounced from the nasal cavity, like; /n/, /m/ and /ing-sound/. /ing-sound/ is the sound of ing that always comes at the end of present participle like, cooking, managing, breathing etc. The sounds that are pronounced by sudden release of air-stream with hissing friction, like; /j-sound/and /ch-sound/. It might be something strange that all the sound is actually voiced at the same time. But voiced here means the vibration in the vocal cords. Any consonant that creates vibration in vocal cords is called voiced otherwise it is voiceless. Now look at two consonants; /b/ and /p/. Just pronounce them and you will know. When you pronounce /p/ it is slight and no vibration in vocal cords is felt whereas if you pronounce /b/ it causes vibration. How to feel the vibration in vocal cords? Block your ears with the palms of your hand and pronounce /p/ and /b/. in /b/ you will feel some sort of vibration in vocal cords. Feel your larynx with your hand and pronounce /p/ and /b/. You will feel the difference. In short while pronouncing voiced consonants the vocal cords are involved whereas in voiceless there is glottal stop. The glottis is blocked and the air-stream in mouth suddenly comes out.